← Fracing the Bow River: “The most important resource in the province, and the rarest, is water” Then why let “No duty of care,” legally immune, Ex-Encana led, Charter violating AER permit multinationals to frac it? COMPENDIUM OF SCIENTIFIC, MEDICAL, AND MEDIA FINDINGS DEMONSTRATING RISKS AND HARMS OF FRACKING (unconventional oil and gas exxtraction) Third Edition by Concerned Health Professionals of New York & Physicians for Social Responsibility. October 14, 2015. 9) The risks posed by fracking in California are unique. One in every eight Americans lives in California, and hydraulic fracturing in California is practiced differently than in other states, making its risks different, as well. California is the only state that allows fracking waste to be held in unlined, open pits, which creates risks for both air and groundwater contamination. Wells are more likely to be vertical rather than horizontal, and the oil-containing shale is shallower. Hence, much less water is used per well for fracking as compared to other states. However, the fracking fluid used is much more chemically concentrated, the fracking zones are located closer to overlying aquifers, and the risk of a fracture reaching groundwater is higher. As the letter says, in their review of fracking, New York’s Department of Health (DOH) and Department of Environmental Conservation (DEC) rightly noted the potential for harmful air impacts, environmental impacts and other risks from infrastructure. (DOH Health Review p. 5 and Findings Statement p. 27) Given the risks, this year the Medical Society of the State of New York and the American Medical Association each specifically called for comprehensive health impact assessments regarding the health risks associated with fracking infrastructure, including natural gas pipelines and compressor stations. 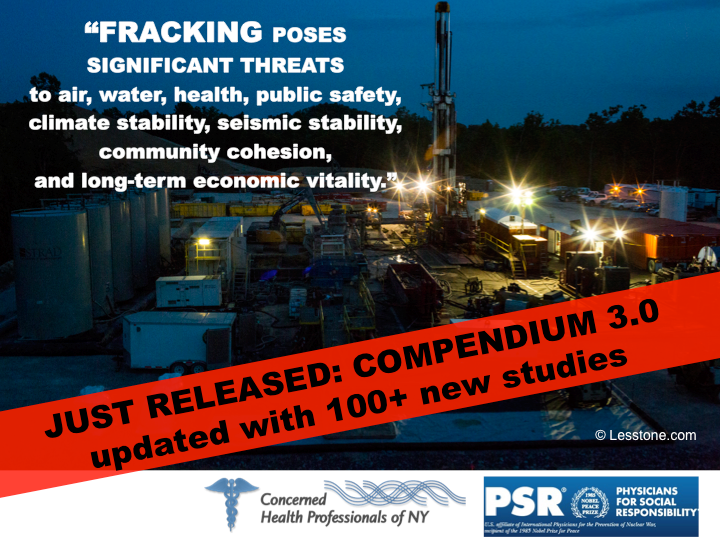 I’m thrilled to report that Concerned Health Professionals of New York, together with our colleagues at the Nobel-prize winning shop, Physicians for Social Responsibility, have just released the third edition of our fully referenced Compendium of Scientific, Medical, and Media Findings Demonstrating Risks and Harms of Fracking (Unconventional Gas and Oil Extraction). The Compendium was written in a moving stream of data. There are now more than 500 studies in the peer-reviewed scientific literature on the impacts of fracking, and the overwhelming majority find harmful effects or significant risks of harmful effects. More than 100 new studies have appeared since we released our second edition immediately before New York announced a ban on fracking last December. For the first time, the Compendium includes a section on the risks posed by fracking infrastructure, including pipelines, compressor stations, and frack sand mining operations. Midwesterners, please note the new section on the risks of silica dust exposure. Californians, please note that we have included a big section on the unique aspects, and risks, of fracking in California. Pennsylvanians, please note that a copy of the Compendium, along with a letter asking for a moratorium on fracking in PA in light of the evidence for harm, was sent today to Governor Wolf from CHPNY, PSR national, and PSR Philadelphia. Letters were also sent today to President Obama and the governor of Maryland. Josh Fox, please note there is a lot of new stuff in here on occupational risks to workers. All together, findings to date from scientific, medical, and journalistic investigations combine to demonstrate that fracking poses significant threats to air, water, health, public safety, climate stability, seismic stability, community cohesion, and long-term economic vitality. Emerging data from a rapidly expanding body of evidence continue to reveal a plethora of recurring problems and harms that cannot be averted or cannot be sufficiently averted through regulatory frameworks. … Speaking as one of the somewhat sleep-deprived team of authors, I am very gratified that this monograph is now launched into the world.